I founded Microbrewery BROVAR in 2008 in a picturesque suburb of St.Petersburg, far away from the bustle of the city, in Vaskelovo (Vaskela) village, on the estate, surrounded by ancient pines overlooking the ancient Lembolovskoe lake (Lempaalajärvi). 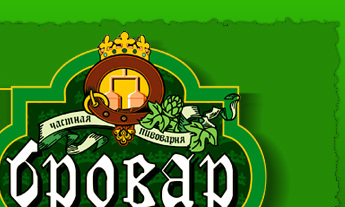 The uniqueness of the brewery is that it revived the family tradition of brewing in an original recipe dating back to the mists of time and is unique model of family business in Russia and so far the only family microbrewery in the country. Traditionally non-filtered non-pasteurized Premium class beer BROVAR is manufactured using only water from my own 175 meters deep artesian well within "lenbolovsky fault", which is natural phenomenon, high-quality Czech and German malt and hops and a live yeast culture in accordance with German law of brewing purity of 1516. Brewery Equipment made by DESTILA (Czech Republic) can be used as infusion (German) and double-boiling (Czech) mashing methods and their combinations, which allows the faithful brewer show his craftsmanship and prepare high-quality beer of Premium class of BROVAR commercial brand which worth the discerning connoisseurs of non-filtered non-pasteurized beer.